Valuable First and Business Class redemptions can be unlocked at reasonable rates when you buy Alaska miles at 2.11 US cents each. Ends 18th March. The latest Alaska Airlines Mileage Plan buy miles bonus ended less than three weeks ago, and you know what that means: Time for another bonus offer! This one is only running for around a week, and most accounts are targeted for a 40% purchase bonus, allowing you to top up your balance with miles at 2.11 US cents (around 2.86 Singapore cents) each. Alaska miles aren’t for everyone, and better bonus deals are occasionally offered, but they are a great frequent flyer currency to hold for good value Business Class and First Class redemptions in Asia-Pacific and beyond with a number of airlines. Simply log on to your Mileage Plan account to check how your individual bonus is structured. Alaska tends to tailor these promotions slightly depending on your customer profile, so not everyone gets exactly the same deal. For example in the December bonus I was targeted at the 50% rate, while Eddie was offered 40% with a slightly different structure based on the quantity of miles purchased. We also received differently structured offers in the January ‘buy miles’ bonus. This time we have both been offered the same deal, which is rare. The offer closes at 11.59m PST on Sunday 17th March 2019, which is 2.59pm on Monday 18th March 2019 Singapore time. Last year Alaska Airlines removed their limitation that only accounts 10 days or older were able to buy miles. That means you can sign up for an Alaska Mileage Plan account at any time and see what miles purchase bonus you are entitled to straight away. The exact bonus structure offered won’t be known until you register, but it’s worth a try so sign up now if you don’t yet have an account. Even if they don’t give you a very good bonus this time, you’ll be all set for the next one (fingers crossed for a 50% bonus soon). Previously there was no limit to how many Alaska miles you could purchase each year, with the maximum you can buy in one go being 60,000 before any applicable bonus. There was nothing to prevent you from making repeat transactions to increase your miles stash to the level you needed. Since January however, assuming you don’t hold elite status in the Alaska Mileage Plan scheme (MVP, MVP Gold or MVP Gold 75K), you are now limited to 150,000 miles credited per calendar year from points.com (i.e. buying miles as in this promotion). That includes the applicable bonus, and any miles gifted to you through points.com. Remember this only applies to miles credited by points.com, and you are still free to transfer miles into Alaska on top of that annual cap from hotel loyalty programs for example, and of course from any eligible revenue flying. When used correctly, Alaska miles can represent very good value at these high bonus rates. The current 40% bonus is the second highest the airline tends to offer, with occasional 50% bonus deals making the purchase even sweeter. Don’t worry if you have no plans to fly on Alaska Airlines though, as you probably already know it’s First and Business Class redemptions with Alaska’s partner airlines where the value of this frequent flyer currency lies. If like us you’re based in Asia, options include Cathay Pacific or JAL Business / First Class to the USA, Qantas from Sydney to Dallas in First Class on the A380, even Qantas flat-bed A330 / 787 domestic Business Class can be a steal with these miles. We’ve outlined the great uses of Alaska miles to and from this region before, but here’s a recap of the options applicable to the majority of our readers in Asia-Pacific. All of these can be searched and booked online via the Alaska Airlines portal, with the exception of Cathay Pacific awards where you’ll have to call Alaska Airlines to book. You can use a program like British Airways Avios or American Airlines AAdvantage sites to search Cathay Pacific availability before calling to book. As we’ve mentioned before, we hear varying stories regarding what Cathay Pacific availability Alaska phone agents can and cannot book for you. We generally find the Cathay availability shown on the BA Avios site to be accurate. Though a number of the reports we read about are negative, when we checked in October last year while trying to secure a Cathay First Class HKG-LHR redemption with one available award seat showing on the BA site, the Alaska phone rep could see two First Class award seats on this flight. 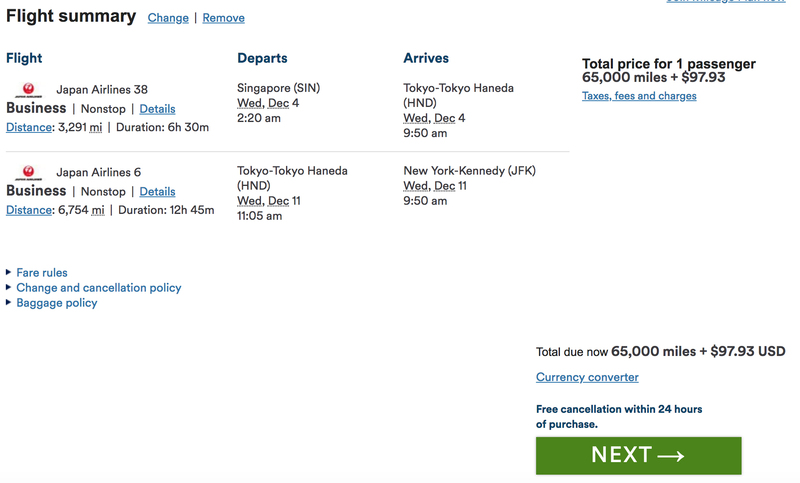 Note that you can fly Singapore to Europe on Cathay Pacific in Business Class using Alaska miles, but they will charge you for the Singapore – Hong Kong (Intra-Asia) and Hong Kong – Europe rates combined (22,500 + 42,500), making it a relatively poor deal at 65,000 miles in Business Class. It’s better to position to Hong Kong with a low-cost airline then take the competitive Business Class 42,500-mile rate using Alaska miles from there in our opinion, or use Avios to get to Hong Kong on Cathay for 20,000 points in Business. We’re starting to sound a bit like a broken record here, but once again there’s still no sign of the ability to use Alaska Miles on Singapore Airlines flights. The most recent addition for redemption was Finnair in August last year. We would still expect the two partners to be targeting Singapore Airlines’ upcoming Singapore – Seattle services in September this year at the latest for reciprocal award redemption across the two frequent flyer programs. One thing’s certain – you should never buy Alaska miles at full price. You shouldn’t even buy them at anything less than 40% bonus, because frankly this is now an almost ludicrously regular offer. If you don’t need to jump on a redemption soon, it may also be a good idea to hold off for the top 50% bonus offer, previously appearing only once a year but which has lately coming around more often than that. As for whether to buy at all, our advice never changes. Have a plan to use these miles first. If you can use them wisely, Alaska miles are a valuable frequent flyer currency, and you can achieve excellent value from them on a variety of routings. wanted to ask about the JAL stopover trick. it seems that now when you do a search for an award from singapore to tokyo and from tokyo to bangkok, the second leg is always in coach. are you getting the same results where the first leg is in business, Singapore to Tokyo and the second leg Tokyo to Bangkok in coach regardless of the date? No issue here, it’s probably a case of finding a date with Business Class availability on the second leg. Nice info. I would like to try out Brussels to HKG in First Class. Which airline? As I think Cathay is using A350 on BRU-HKG? 1. Yes it is possible to do a stopover on SIN-TYO-USA with JAL, however Business Class award seats on Tokyo to the USA can be hard to come by. My advice is to search that route in isolation (e.g. HND to JFK) then once you’ve found a date which suits you do the multi-city search to add the SIN-HND flight to the start of your itinerary (those flights have much better availability). 2. Which site are you using to search CX availability? I assume you know it doesn’t show on the AS site. The F cabin is very infrequently used on SIN-HKG these days, so you may have to repeat the process above (i.e. find availability first on the HKG-USA flight), then live with Business Class on the first sector from Singapore (though you will be charged the full F mileage rate of 70,000 or 80,000 miles depending on the US destination). I’m using BA to search for availability. 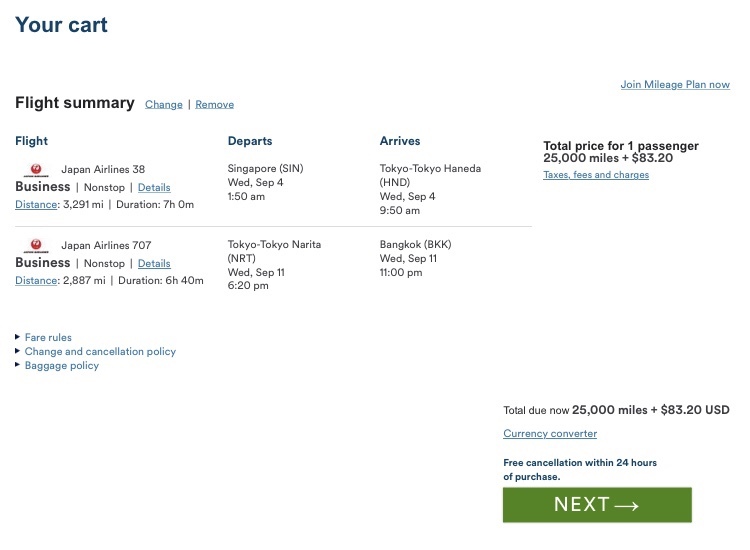 but with a stopover in japan, i cant seem to find any availability for JAL anymore on alaska. Sometimes it’s the site which doesn’t help (i.e. I find it implies you are not doing a stopover, even though your search was multi-city continuing from Tokyo on a later date). Both flights show as though you’re flying straight through. Then once you click it, the stopover shows (second flight is a later date as you specified). Is that the issue you’re having? Previous Entry CAAS grounds the Boeing 737 MAX. What now for SilkAir?